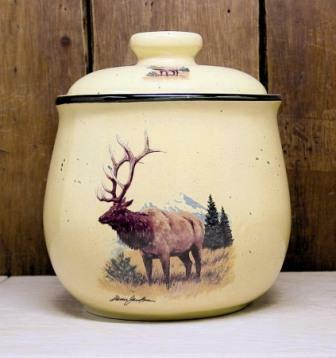 Lodge Collection Cookie Jar- Approximately 9" H and 7" Diameter at the base and includes an air-tight seal for freshness. Features a unique color - a soft yellow hue with black speckles and a hand painted black rim. Original Artwork by Dann Jacobus, decorated with the Landscape Elk Mountain Scene.